Google isn’t the type of company to sit by and watch other software firms take control of any given market and now it appears they have Flipboard, AOL Editions and Yahoo’s Livestand in their sights, planning a new app of their own called “Propellor” which will launch on Android and iPad based devices. 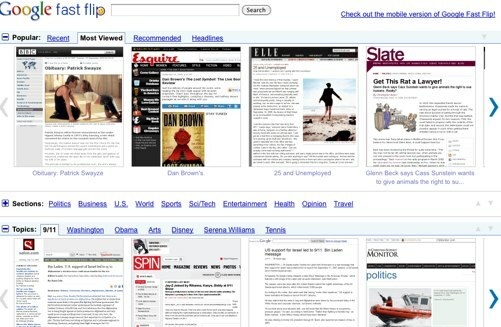 It wouldn’t be the first time Google attempted to change the way users read digital content, they originally launched Google Fast Flip (pictured above) to abysmal reviews, only to kill the project a short time later. The move makes sense from a user standpoint as more applications and websites attempt to help users better navigate through social and media feeds. The move also means Google can attempt to attract more of the “touch friendly” user market who focus their efforts on mobile and tablet browsing.